Something so daintily hand-stamped and goccoed. I love this little glimpse of a shower invitation. 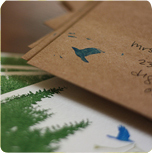 The colors, the textures, the little bluebird stamp…all of this inspires me! I itching to get out the gocco again.